Lock in a great price for Danubia Gate – rated 9.2 by recent guests! The staff were very helpful and nice . Very proactive and always willing to help with a smile. 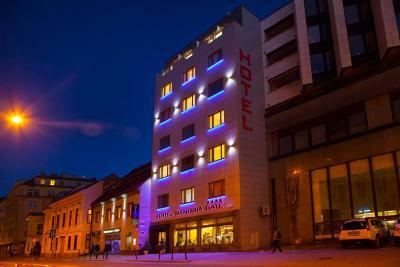 Superb hotel in the heart of Bratislava. 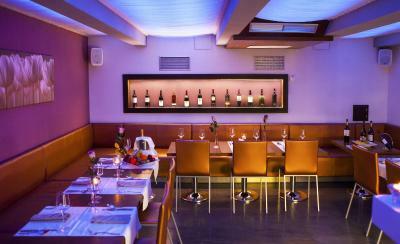 Location is great as all the city attractions are within a walking distance. The rooms are cozy and spotlessly clean. 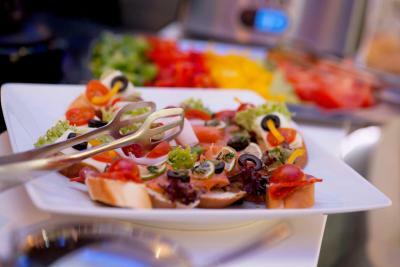 Rich breakfast and very comfortable facilities. 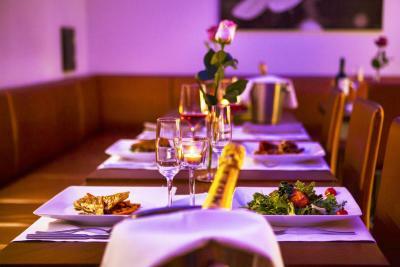 The staff is extremely kind and helpful and puts a great finishing touch to an overall fantastic experience. Also a welcoming drink at arrival which is a really nice detail. Highly recommended! 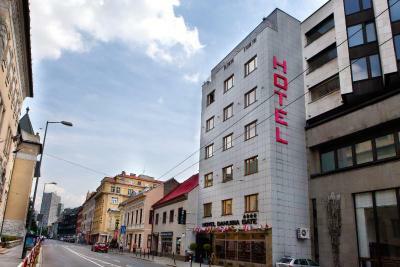 The hotel is close to the old town, very nice, clean and friendly. It has a safe payed private parking. 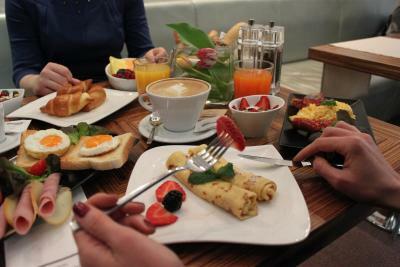 The breakfast is tasty and generous. The staff was very kind and friendly offering all information needed. Great and welcoming hotel. Very friendly reception from the desk clerk, Eva. She put us at ease from the first moment we arrived. Very clean rooms with nice touches: chocolates in room, water, juice, champagne and biscuits available at reception. 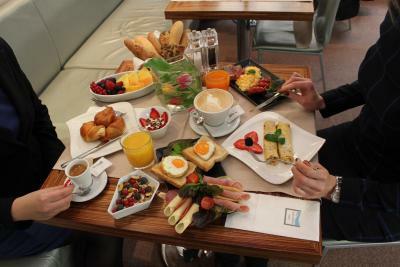 The staff was very cheerful and helpful, the breakfast was lovely and the location is perfect for exploring the old town. A great stopover for us, would love to spend more time there. The staff was extremely helpful. Nice location and good value. 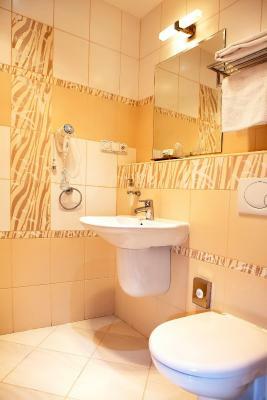 Location, excellent staff, spacious room, comfortable bed, Jacuzzi tub, great breakfast. This will be our destination spot when we come to Bratislava. Danubia Gate This rating is a reflection of how the property compares to the industry standard when it comes to price, facilities and services available. It's based on a self-evaluation by the property. Use this rating to help choose your stay! 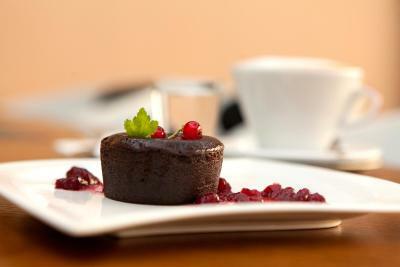 One of our best sellers in Bratislava! The stylish Danubia Gate hotel is a 5-minute walk from Bratislava's Old Town and the Danube. 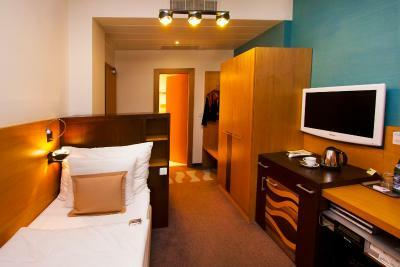 It offers free WiFi and rooms, laptop (per request), TV, including free internet. 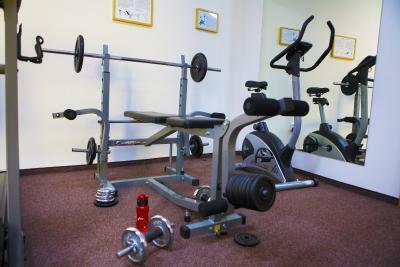 Free fitness center is available for 24 hours. The Slovak National Theater on Hviezdoslavovo Square and St. Martin's Cathedral can be found 1,650 feet from the Danubia Gate hotel. 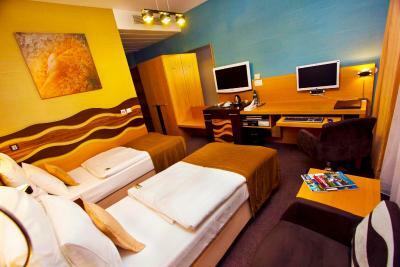 All of the air-conditioned rooms have an LCD cable TV/PC, including international cable and satellite channels. Each room is equipped with a mini-bar and tea and coffee making facilities. A bottle of mineral water is offered upon arrival. 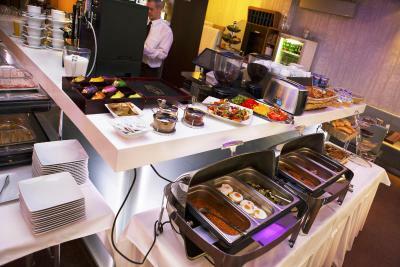 The Danubia Gate's restaurant includes a café and offers you gourmet Slovak and international cuisine. 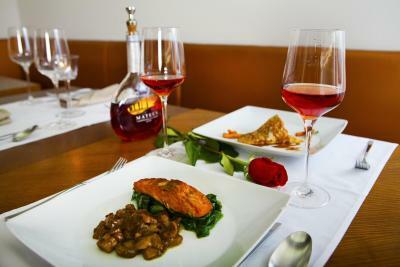 Selected Slovak and foreign wines are also available. When would you like to stay at Danubia Gate? This modern room features a flat-screen TV with satellite and cable channels. It includes a computer, DVD and CD player, and comes with a minibar and an electric teakettle. This modern room features a flat-screen TV with satellite and cable channels. It includes a DVD and CD player, and comes equipped with a minibar and an electric teakettle. This modern room features a flat-screen TV with satellite and cable channels. It includes a DVD and CD player, and comes with a minibar and an electric teakettle. This spacious and modern room features a sitting area with 3 flat-screen TVs with satellite and cable channels, including a TV in the bathroom. 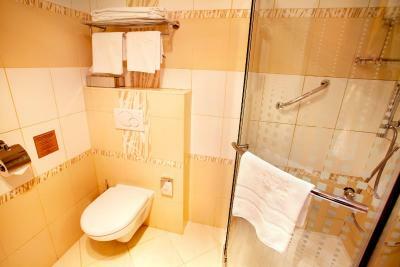 Each deluxe double room comes with a hydro-massage bath for 2 people, slippers, and bathrobes. There is also a printer, computer, and DVD player. House Rules Danubia Gate takes special requests – add in the next step! Danubia Gate accepts these cards and reserves the right to temporarily hold an amount prior to arrival. A group booking cannot be canceled and has to pre-paid at least a month in advance. Early check-in is available upon request and for an extra charge. Very friendly staff, liked the little touches like the welcome drink and chocolate on leaving. The hotel was very clean and breakfast was perfect. Great location. We checked in late but that wasn't a problem and taxi arranged for our return. Central, clean and nice space. Quite spacious too. Breakfast was fine, but not so extended. Capacity of breakfast room sometimes insufficient. Staff is very kind. Room was quite OK. Very helpful employees!!! They talk very good English!! The breakfast the Best in Town!!! Staff checking us in and the room. The hotel was perfectly adequate for our needs. We were in Bratislava for a weekend with our son. The room was large and comfortable given there were three adults. 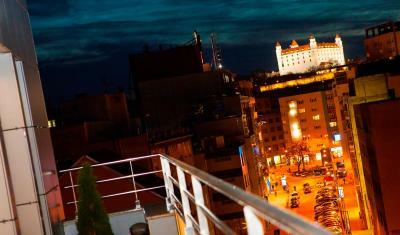 The hotel is a little out of the old town and on the opposite side of the old town from Bratislava Castle. However, the historic area of Bratislava is not large so it is not a long walk in. Facilities were good; bed was comfortable; there were plenty of choices - hot and cold - for breakfast and the staff made coffee / tea for guests. We were particularly appreciative of the e-mail that we received a day or two prior to arrival giving instructions on how to get the tram from the train station to the hotel. I didn't love the section and was at some point followed on the way back to the hotel. The staff really went out of their way to make the hotel comfortable and welcoming! The local bubbly wine was especially welcome to start out the hotel stay, as was the chocolate on my pillow. They offered water in the room, which is always fantastic, and a choice of pillows. The breakfast was also excellent. I loved the street art just around the corner from the hotel. The biscuits at reception were amazing. The staff were friendly and very helpful. Rooms were a good size. Many choices for breakfast and excellent coffee.